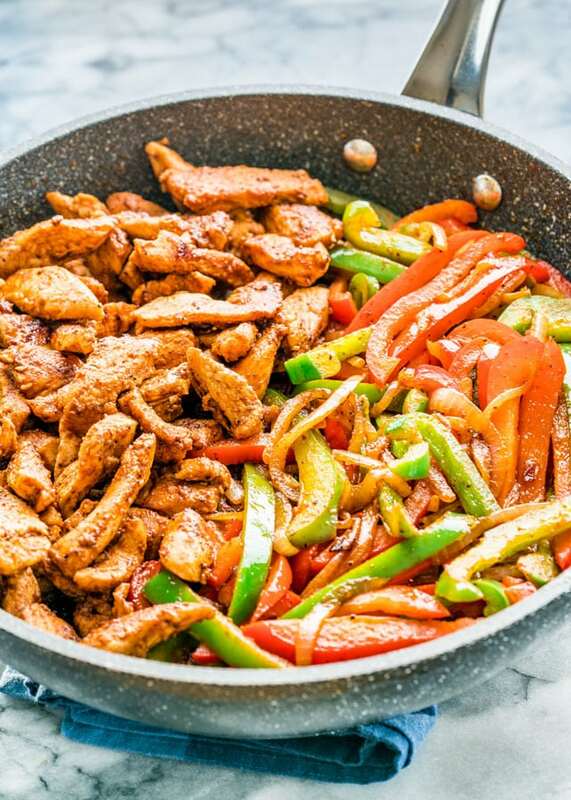 These Easy Chicken Fajitas will become your favorite weeknight meal! Just like the restaurant version but homemade and ready in 30 minutes. Here’s my go to chicken fajita recipe, as promised. There’s always a reason to my madness. Because you just can’t have fajitas without the fajita seasoning and some good homemade salsa. Before we get into the recipe, I just wanted to say I’ve had one of the best weeks ever with my friend Nagi from RecipeTin who visited me all the way from Australia and we had a blast. I didn’t know two people could talk as much as we did. In the 5 days she was here, there wasn’t a moment of silence. We didn’t even do much sightseeing besides going to the Stampede, some shopping and going to Saskatoon Farm where we had the best Saskatoon berry pie ever. The stampede was fun as always, I don’t think we’ve ever had a bad time there. Of course we had to sample pretty much all the foods there, which were all deep fried. My favorite were the deep fried oreos, never thought I’d say that but yeah, I really did love them. 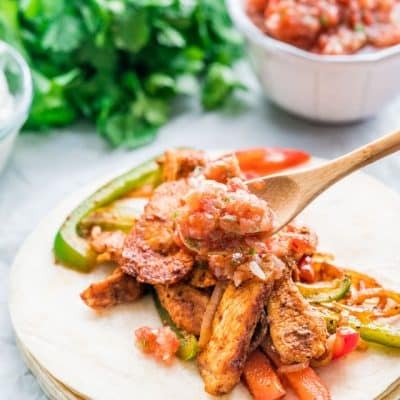 Anyway, I’m now sharing with you, or should I say resharing with you my favorite easy chicken fajita recipe with new pictures and video. 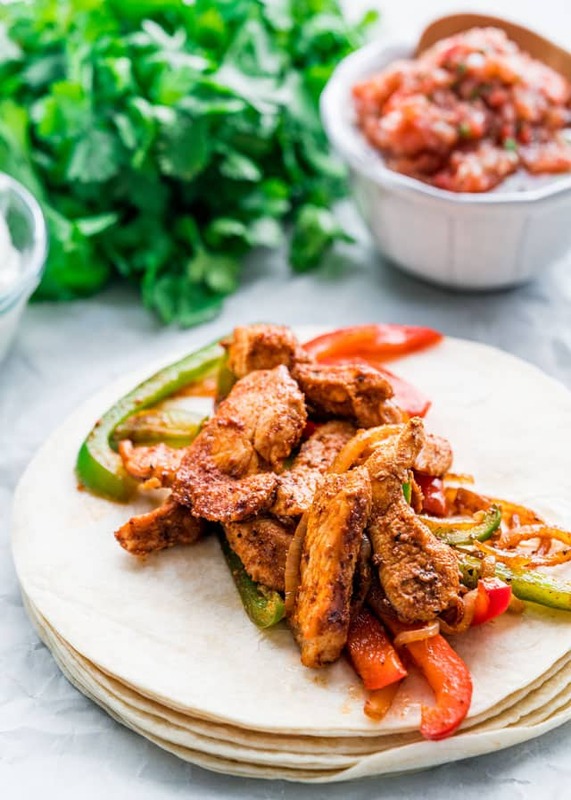 Did you know that fajitas is a Spanish term and it usually refers to a grilled meat served in a taco or a flour corn tortilla? So you can literally make these fajitas with any meat you like. However, chicken fajitas are my favorite. So since it usually refers to a grilled meat, you can grill the chicken breasts then cut them up in thin strips and pile them up on your tortillas. However, I love my skillet meals, so I made this all in one skillet. It’s quick as in 30 minutes, all in one pot, and pretty healthy considering all the bad food we’ve had this week. Nothing is deep fried here. I learned to make this dish a long time ago when I first lived on my own, we’re talking a very long time ago. It’s very easy to make, full of flavor and it was my go to meal for a quick yummy dinner. Did I mention fajitas are like my favorite food ever! I do cook the chicken separately from the veggies because obviously the chicken takes longer to cook, but before the veggies are done I add the chicken back to the skillet and toss everything together. To serve these fajitas all you’ll really need are some tortillas, sour cream and salsa. This is such a great meal, it’s filling and it’s delicious and you can literally put this together any night of the week in half an hour. 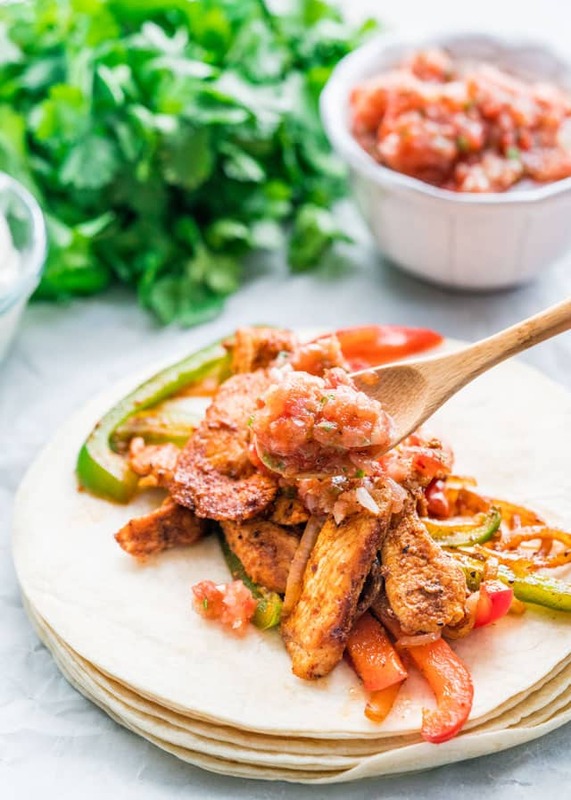 These Easy Chicken Fajitas will become your favorite weeknight meal! Just like the restaurant version but homemade and ready in 30 minutes! Cut the chicken breasts into long strips; set aside. Slice the onion into long strips. Slice the peppers into long 1/4 inch strips. Heat the olive in a large skillet. Add the chicken to the skillet then sprinkle about half of the fajita seasoning over the chicken and toss. Cook the chicken for 5 to 10 minutes until it's fully cooked and no longer pink, and it's slightly charred, but not burned. Transfer the chicken to a plate and set aside. Add another tbsp of olive oil to the skillet, if needed. I used a non stick skillet, so it wasn't necessary to add anymore oil. Add the onion and cook for a couple minutes until it's slightly translucent. Add the peppers and the remaining fajita seasoning and toss. Cook for another 3 to 5 more minutes so the peppers cook slightly, you don't want them over cooked, they should be a bit crunchy. Add the chicken back to the skillet and toss with the peppers. Serve over tortillas and top with salsa, sour cream and any of your favorite toppings. If you can't find fajita seasoning, try my Fajita Seasoning recipe. A pre-made fajita sauce will also work. Recipe originally shared February 2012. I love fajitas! I came across this recipe on Sunday, made it today and it was delicious. I used your fajita mix seasoning. Thank you for sharing. I just made this and it was delicious. Couldn’t find fajita seasoning but did find fajita sauce. Still came out great. Everyone loved it. Will be making more this weekend. Thanks. Great Recipe! Will be trying this coming weekend! Sounds great. You will find this dish to be easy to make and even easier to eat…..
We make this one often It’s fast and easy on a school night and everyone loves it! I’ve done it with pre made fajita seasoning as well as from scratch fajita seasoning. It’s very yummy! Thank you! I’ve never seen or purchased or even heard of fajita mix. BUT! I have pretty much every spice on the market. Could you tell me what to throw together that would be close to fajita mix? I’m ready to make these right now!! Thank you Jo…I love love LOVE your blog. Lucky husband you have there. To make your fajita mix simply combine salt, black pepper, chili powder, paprika, cumin, cayenne pepper and garlic powder. Thank you! I just made this for my hubby and I, delicious. We definitely will be making more of this. You’re very welcome! They are super easy to make, glad you liked them. Wow these look Delicious! something to add to my taco night thanks alot!!!! !